Tonight Major League Baseball welcomed the eight RBI softball teams to the 20th anniversary RBI World Series. Representing the continental United States, Hawaii & the Dominican Republic, these eight teams will take part in a series of events this week, culminating in the Championship Game held at the Jane Sage Cowles Stadium at the University of Minnesota on Sunday. 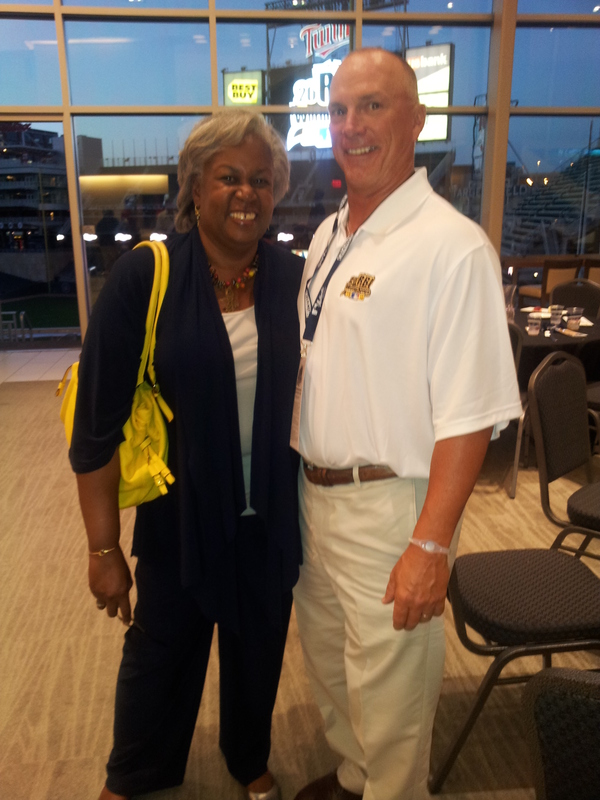 The teams – Cleveland, Hoboken, Harrisburg, Pattillo, Mathews-Dickey, Hilo Hawaii, Houston & Dominican Republic – enjoyed dinner at Target Field, an event that featured Sharon Robinson, the daughter of Jackie Robinson, a friend of Major League Baseball who has spent years advocating for the RBI program. We spent a few minutes talking with Sharon and gave fans an opportunity to submit their own questions. Here is the first portion of her Question & Answer session. Sharon Robinson with Harrisburg coach Robert Sullivan. Major League Baseball takes this very seriously and we have a wonderful program – the RBI Program – that is in cities all over the country and the Caribbean. We try to expand our presence in the urban areas through our RBI program and then we also have started establishing baseball academies, which will take players to that next level and gear them more towards professional sports. We’re looking at it from every angle. We have another program where we work with women in minority-owned business and we try to bring them into baseball, so there are just a lot of things going on and hopefully we’ll be successful in keeping the numbers stable and to start seeing them go upward. On Sunday, you were able to see the Jackie Robinson RBI program win their first RBI World Series at Target Field. What was that like for you? It was very cool. I had told them the night before that I live in Sarasota so I’m right next to Bradenton and they were playing the Jackie Robinson league in Jersey City. So we are supposed to be neutral, being from the Commissioner’s Office. I was very calm through most of the game and then we got to that last inning and I saw what was happening… Very, very cool. And when I got on the field, the players said, ‘We told you we were going to do it for you.’ So it was very emotional, very proud of them. What sets the RBI softball program apart and how has it impacted the softball community? The softball program instills several things. One, it does keep girls involved in the game of softball — some of them are freshmen in college when they are still with the RBI program. So we have them for quite a while and we help them develop their skills. We also help them get into college and get scholarships; we give our own scholarships as well. We really encourage the girls to see this as a jumping off point in furthering their career… We want them to all be prepared to have a career and work and be able to support themselves and their families. Many of these young women will go on to play college softball. What motivated you to start the Breaking Barriers program with Major League Baseball? I started the Breaking Barriers program in 1997, it was the 50th anniversary and the theme for that year was Breaking Barriers. So I kind of took that theme, came to Major League Baseball and I said, ‘I would like to work with you.’ They said yes. So I took that theme and combined it with character building because I thought that was a part of my father that younger generations could grab onto and make it their own. And that’s exactly what has happened. So over the 16 years, we’ve had incredible response from kids. Thousands and thousands of essays, reached 22 million kids and they’ve all talked about obstacles and barriers they’ve had to overcome.